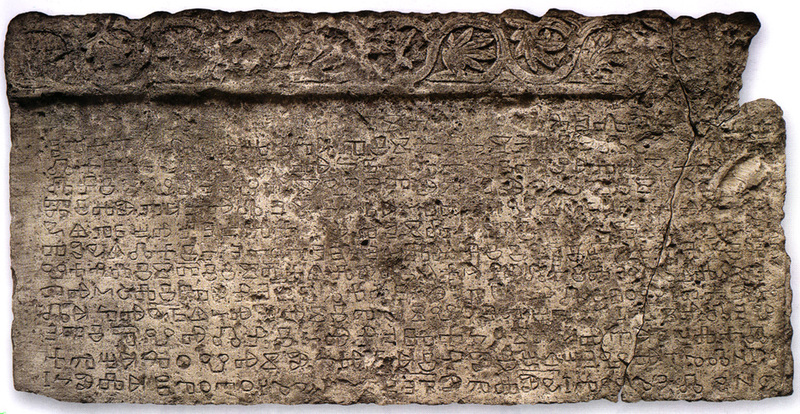 The Baska tablet is probably the most famous monument of early Croatian literacy, dating from about 1100, i.e. almost four centuries before the discovery of America. Its size and weight are impressive: 2x1 m, 800 kg. 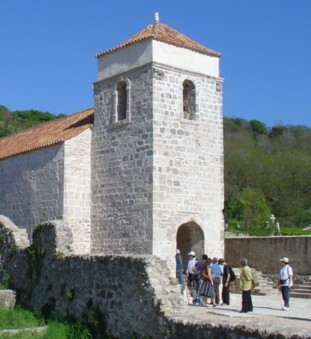 According to Branko Fucic and Eduard Hercigonja, the language of inscription is Croatian - Chakavian with elements of liturgical Church Slavonic, and the script is Croatian Glagolitic. Its importance is, among others, due to the fact that in its third line we can read "Zvonimir, Croatian King". While there are even older documents in the Latin language mentioning the Croatian name, the Baska tablet is the oldest known document in which the Croatian name is written in Croatian language, and moreover, in Croatian Glagolitic Script. 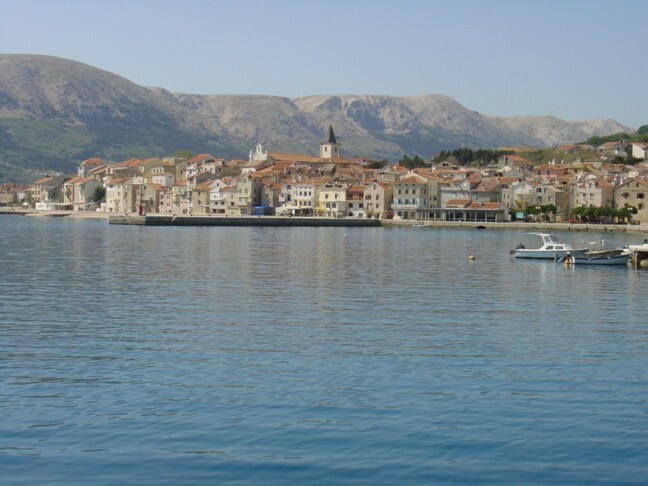 Let us mention that the Croatian name for Croatian language is in use at least since 1275 (it is often encountered in the legal document Istrian Boundaries), that is, more than two centuries before the discovery of America. 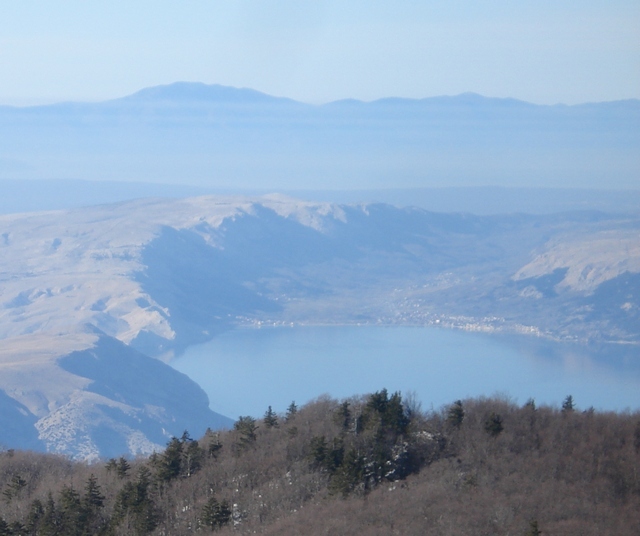 Miraculous view to the Baška valley on the island of Krk and on Učka in Istria from the legendary Velebit mountain. 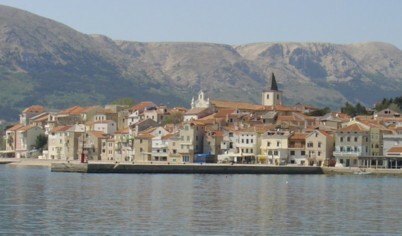 Photo by D.Ž. 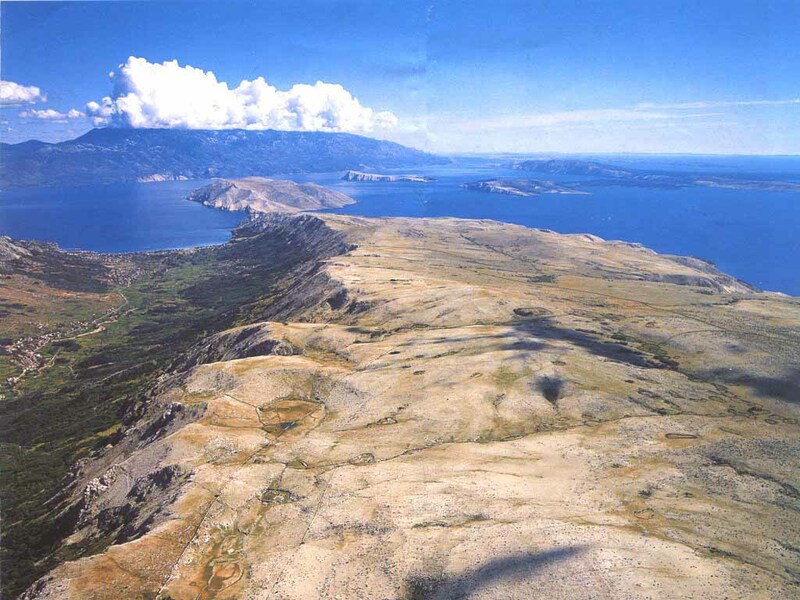 The Baška valley is situated in one of the most beautiful ambiences in the world. 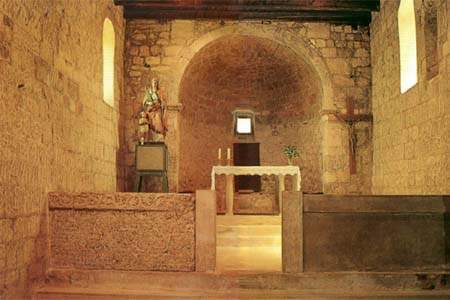 It was found in the church of St. Lucy (Sv. 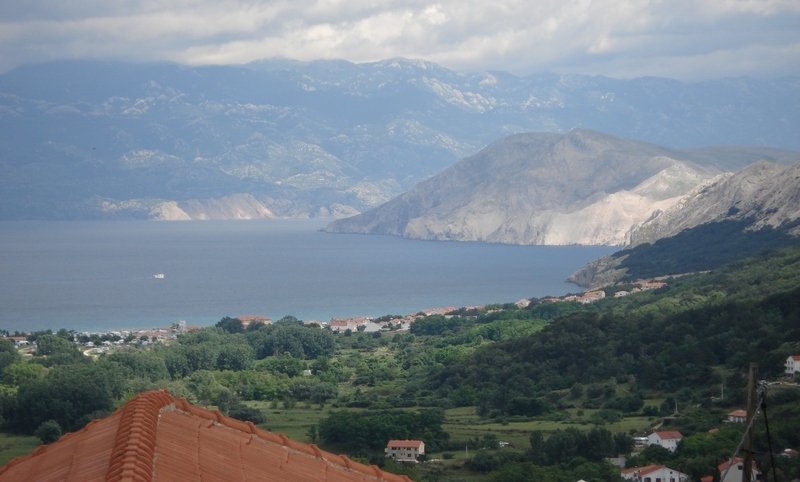 Lucija) in Jurandvor near Baska on Krk, the largest Croatian island. Since 1934 the monument is placed in the main building of the Croatian Academy of Sciences and Arts, and anybody can see it. Its chemical protection has been organized by Dr. Mladen Deželić (1900-1989), professor of chemistry at the Univeristy of Zagreb; see his article [PDF], as well as his laboratory notebook [PDF] (many thanks to Dr. Gjuro Deželić for sending us these interesting documents). missing letters are placed in parentheses. Also, we use stars in *BÏ* to denote that BÏ should be understood as number 12 (by Ï we denoted Izhe; B = 2, Y = 10) and the same for *G*, which is 4. Finally, we use "-" to denote the usual hyphenation of words. 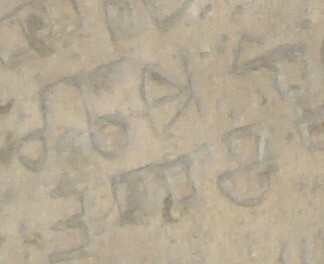 On the original Baska tablet there are no distances between words. 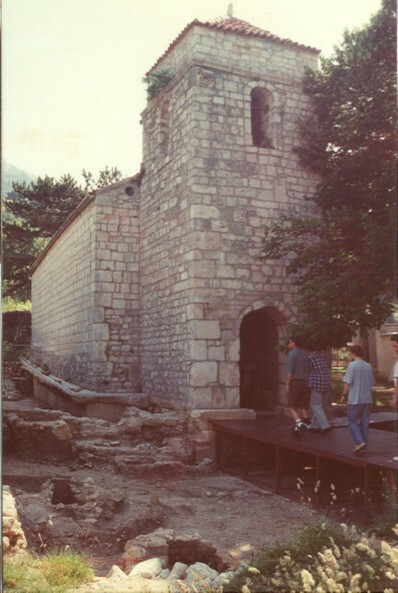 Mikula was in Otočac with St. Lucy (Sv. Lucija) together. 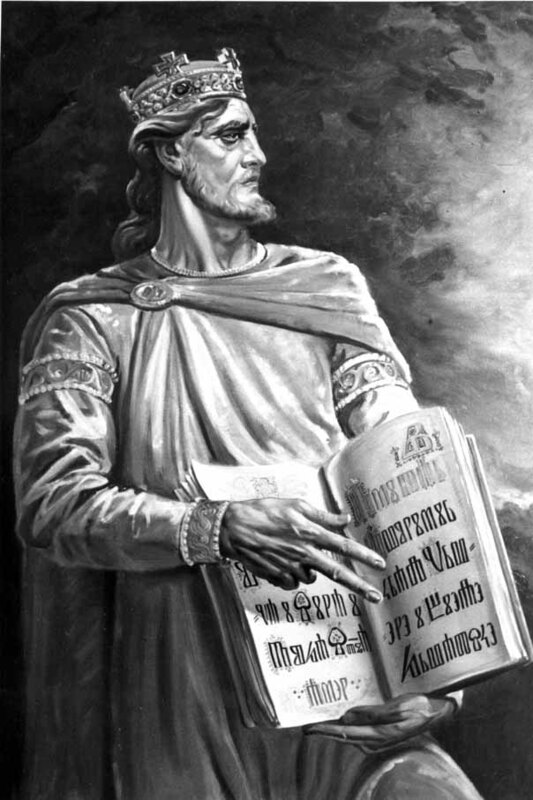 Of particular interest is the third line of the Baska tablet, which mentions the Croatian King Zvonimir. 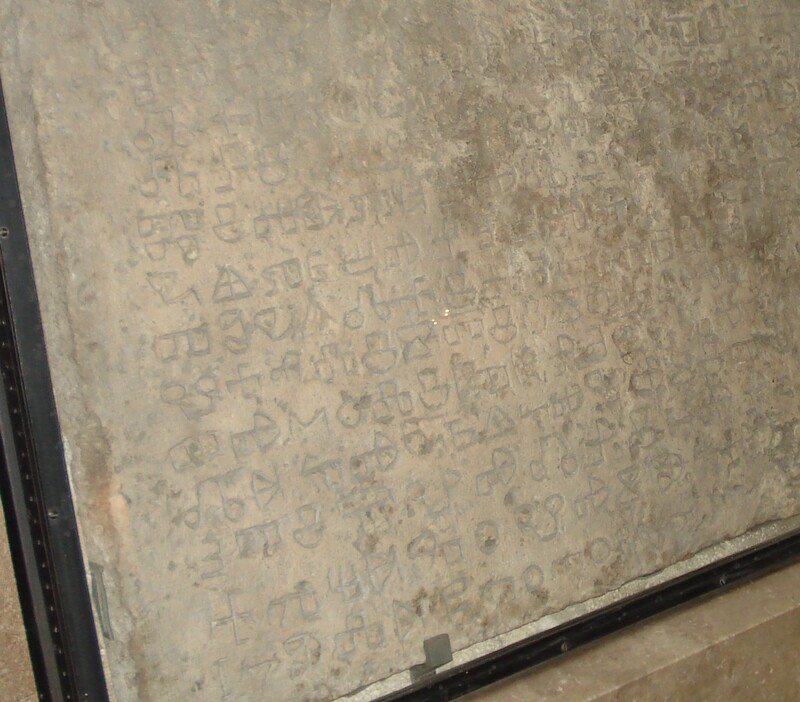 Note that the Glagolitic text corresponding to HR'VAT'SK'[I] ends with K', since the tablet is damaged on this place. 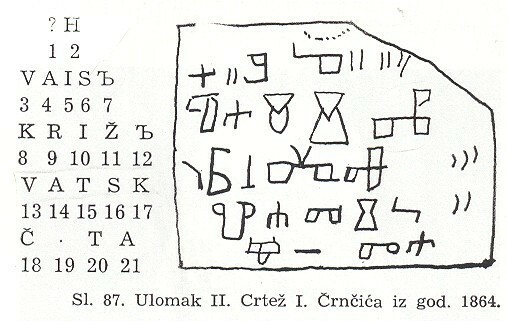 In this form it appears on Supetarski fragment found in Istria in Sveti Petar u Sumi (12th century), and also in glagolitic inscriptions found in Brodski Drenovac near Pozega on the Croatian north, in Slavonia (12th century?). 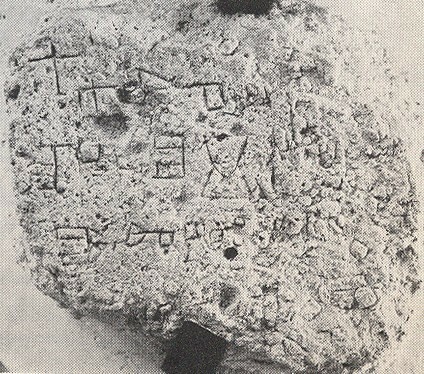 According to Fucic, this is the so called "long A" on the Baska tablet. The triangular A itself is very common in ancient scripts of the Near East. Its source is obviously from cuneiform scripts, and the meaning is known, see e.g. Hans Jensen's monograph Sign, Symbol and Script, (English translation from German; London, George Allen and Unwin Ltd, 1970), pp 85, 87. Curious glagolitic P seems to be related to very old Egyptian group of scripts (Meriotic script), see pp 79 and 81 in the same monograph. 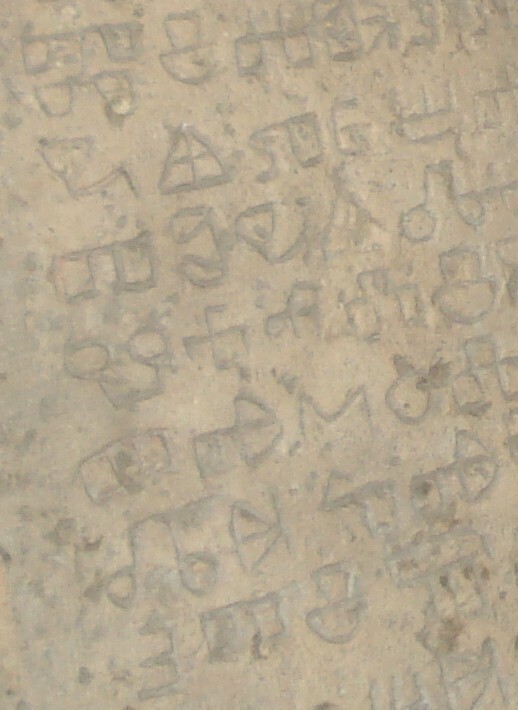 Also some Etruscian letters have analogues in the glagolitic. 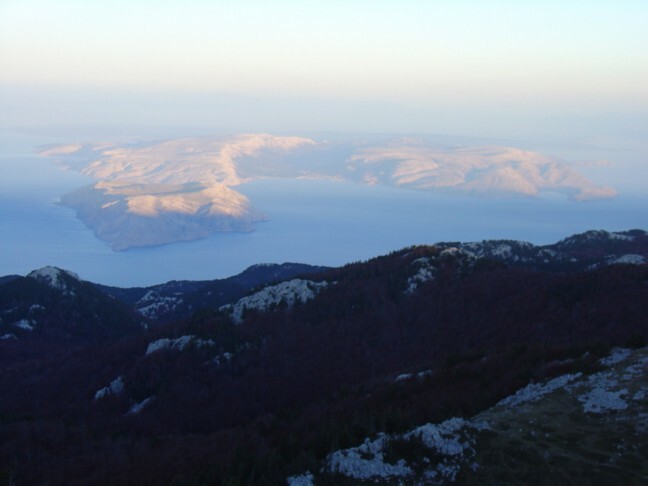 A view to the island of Krk and to its Baška valley from the mountain of Velebit. 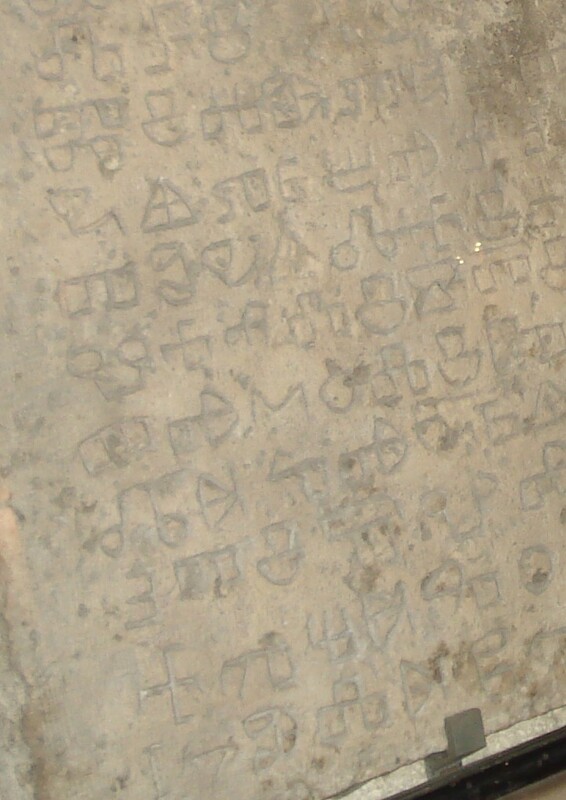 The Baška tablet has 402 characters and 107 words, and as such is the larges Croatian Glagolitic inscription from 10th-12th centuries. 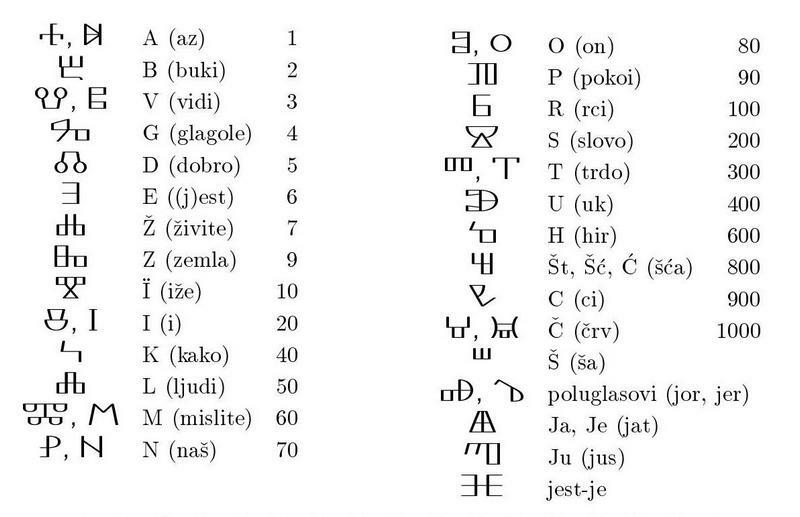 The following two in order are from the region of Dubrovnik: the Župa dubrovačka inscription which has 102 characters and 24 words, while the Konavle inscription has 49 characters and 15 words. Source [Cuncic-Perkic]. 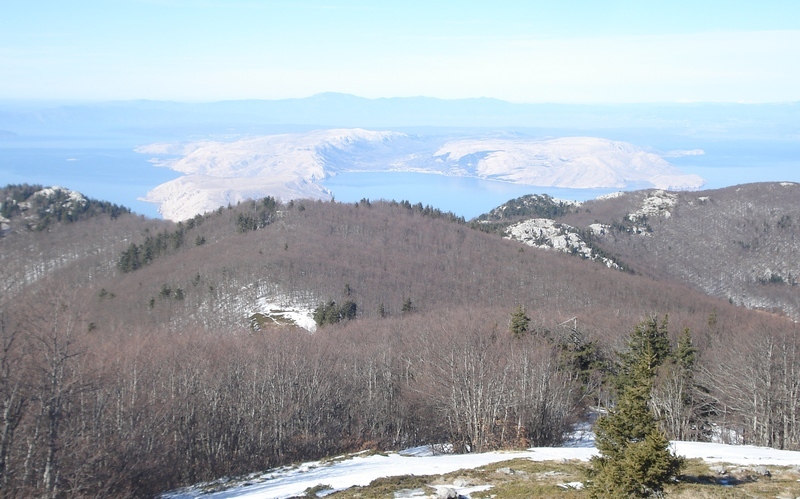 A view to the island of Krk and to Učka from the mountain of Velebti. 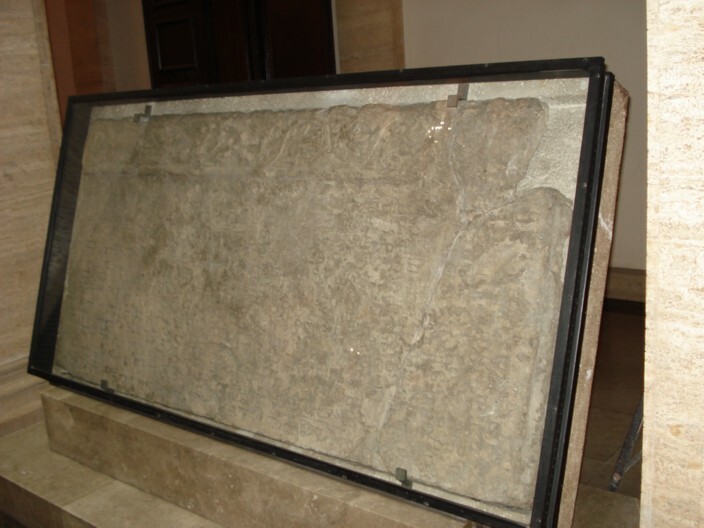 The Baska tablet served as the left side of the former closure screen which separated the church monastic choir from the space for congregation. There existed also the right side of the closure screen, out of which only four small pieces have been left. Photo of the Jurnadvor 1st fragment from no later than 1914, made by J. Brunsmid. According to [Fucic, Glagoljski natpisi, str. 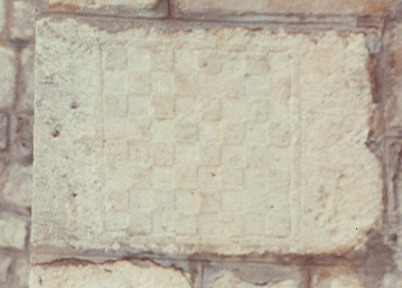 65], the Jurandvor 1st fragment could have belong to the left upper corner of the second Baska Tablet, that is, of the right side of closure screen. Here we can see the text U ZV'ONIM..., and this is without any doubt a part of the name of Croatian King Zvonimir, 11th century. Here we can see the so called bifurcating M, a ligature ZV, and a semivowel ' in the form of the left key. The photo is from 1914 at the latest. The characters are hardly recognizable, and bifurcating M is almost entirely damaged, contrary to the above photo taken some 70 years earlier. As we see, one of the fragments contains the Croatian name (...VATSK...), another a part of name of King Zvonimir (ZV'NIM...), but the content of the whole inscription is unfortunately unknown (see [Fucic], pp 62-65). 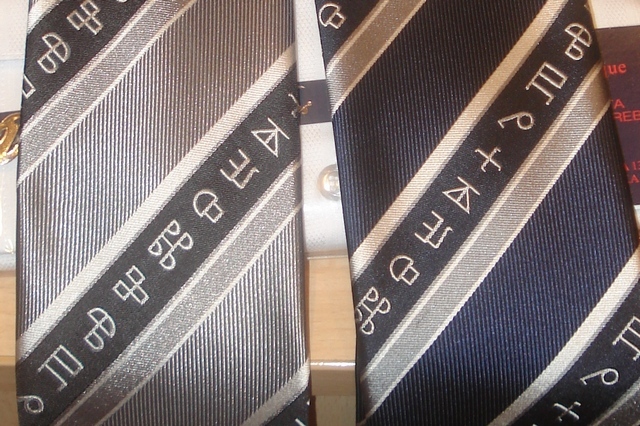 Thus, we can speak of two Baska tablets, the left one which is saved but damaged, and the right one which is destroyed. 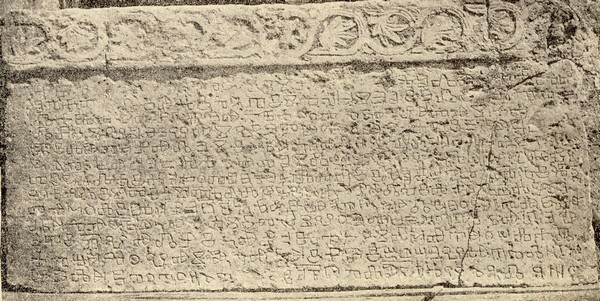 It is worth noting that in the fifth line of the Baska tablet the names of joupan (prefect) Desimir from Krbava and Martin (Mratin) from Lika are mentioned as witnesses. 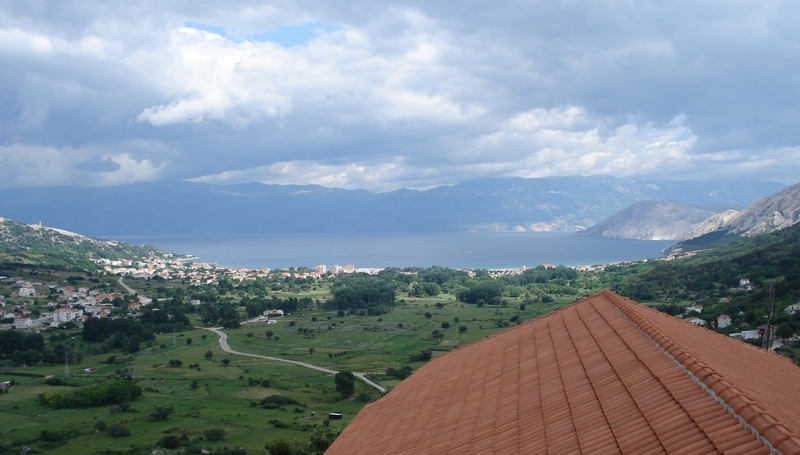 Breathtaking view to the Baška valley and Velebit mountain from the convent Sv. 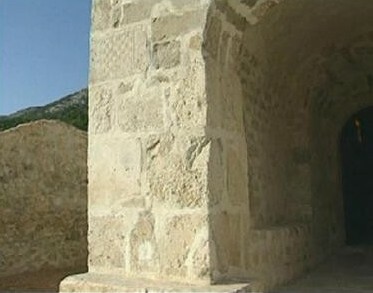 Marije Goričke in Batomalj. 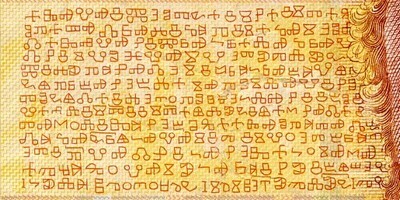 The oldest known confraternity rules written in the Croatian Glagolitic Script are those of the Confraternity of Sv. Marije Gorička, from 1425. Two leaves are kept in the National Library in Norway, and the other have dissappeared. 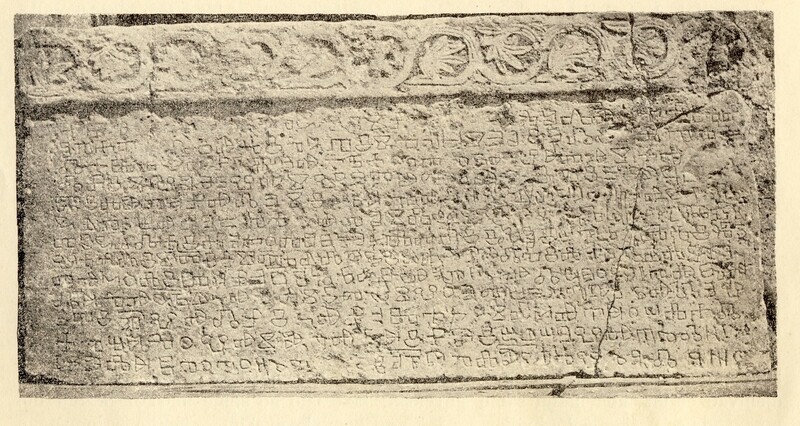 The Baska Tablet has been studied by Ivan Kukuljević Sakcinski (1851), Franjo Rački (1855), Ivan Črnčić (1866), Vjekoslav Štefanić (1955), and Branko Fučić (1982), where the years in parentheses refer to published papers and books. 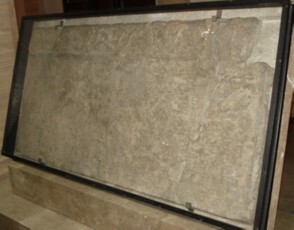 The name "precious stone" for the tablet was given by Stjepan Ivsic, outstanding Croatian linguist. 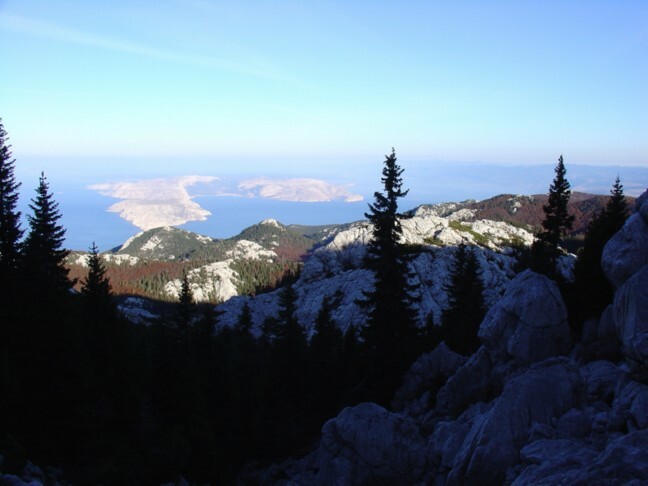 The place where the Baska tablet has been found is a fascinating valley that you can see on the photo, with the mighty mountain of Velebit behind it. Bašćanska je ploča signum temporis iskona nacionalne kulture na više doživljajnih razina: cjelinom vanjske dojmljivosti - od reprezentativnog volumena, jednostavne ljepote motiva trolinijskih vitica i lišca na gornjem dijelu, do likovno ekspresivne, skladne ornamentike glagoljskih slova, kao i svojim sadržajem, "ritmički organiziranom strukturom teksta i, naposljetku, jezikom u kojem se starohrvatska čakavska riječ funkcionalno prožimlje elementima liturgijskoknjiževnoga crkvenoslavenskog jezika, što književni izraz tog spomenika osebujno patinira, utiskuje mu pečat visokog stila. 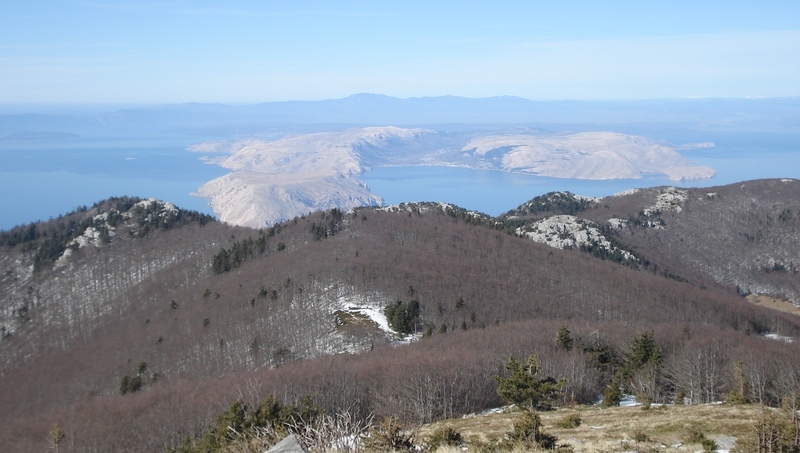 A view to the island of Krk and to Učka from the mountain of Velebit. 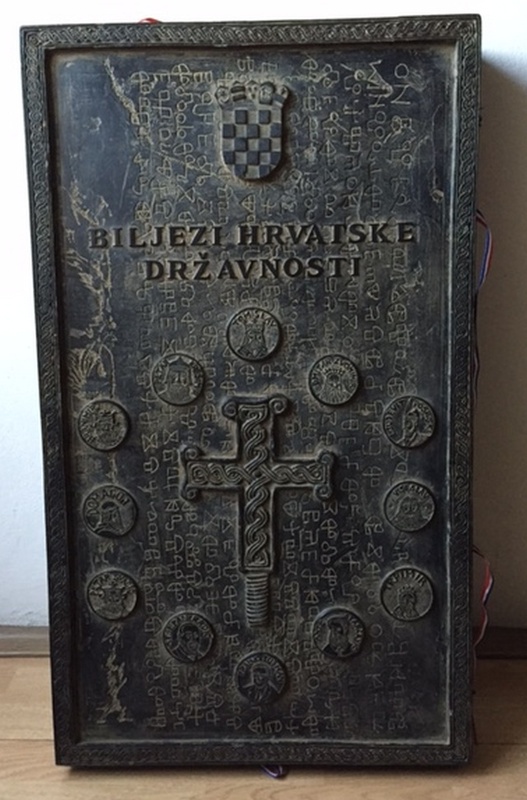 Ivo Frangeš of the Croatian Academy of Sciences and Arts said the Baska Tablet is simultaneously document and monument, history and art, continuous present of our language and of our being, and that all in it is Croatian: its name, language, king, land and spirituality. isfrolani patakuni, žurke* i kadeni. Pute, laze pizon dubli tovari. Gustirne žedne, mijun sići i lati. Intradu pravice s tilin štrukali. Rod puntarski resa na drači. 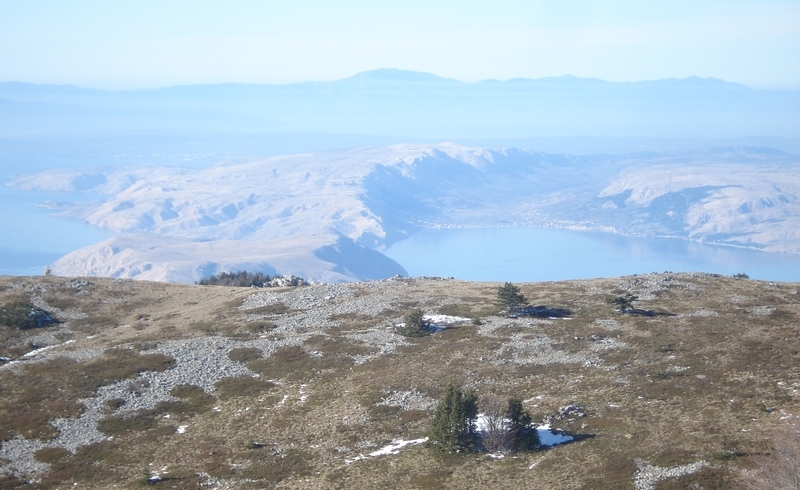 istrošeni patakuni, zurke i lančići. The Baska tablet and its content were also inspiring for musicians. Maestro Ljuboslav Kuntaric's composition "The Baska Tablet" was performed in 2004 by a mixed choir of the parish church from Gernlinden, Munich, Germany, directed by maestro Alfons Strähhuber, in the church of St. Lucy, Jurandvor. Also Stjepan Sulek wrote a capella composition in 1978/79 entitled "Bascanska ploca". Croatian composer Krešimir Fribec (1908–1996) compsed a cantata for choir and chamber orchestra inspired by the text of the Baska Tablet. Distinguished Croatian composer Dusan Praselj is the author of Staroslavenska misa and Bascanska ploca. 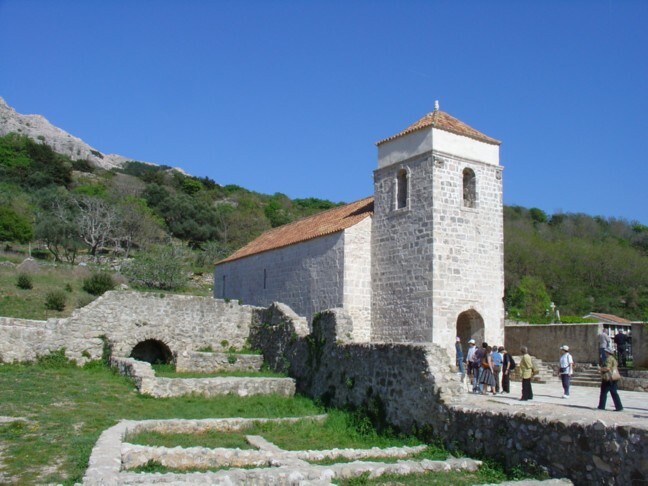 It seems that Dante traveled through Croatia, and with help of Croatian pilgrim, now a friend and guide through Croatia, Bishop Kažotić, he visited Jurandvor on the island of Krk and saw the Baska Tablet. The Baska Tablet on the banknote of 100 Croatian Kuna (HRK), and Ivan Mazuranic (1814-1890). 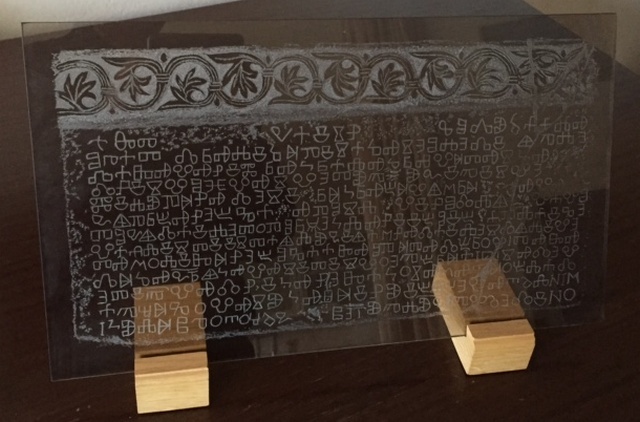 It was only in 1971 that the Baska tablet, the most important monument of early Croatian literacy, was allowed to enter the curriculum of our primary schools. 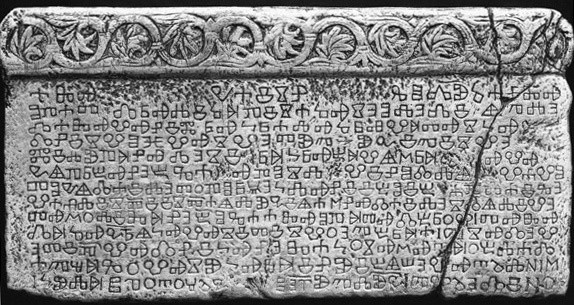 During many years of the communist rule in ex-Yugoslavia the Baska tablet was forbidden in Croatian schools. Similarly to this, European representatives of international community in Bosnia - Herzegovina do not allow that textbooks written for Croatian children in this state mention the Baska Tablet, and even the Croatian national anthem Lijepa Nasa Domovino (Our Beautiful Homeland)! An invitation card to a Christmas party by the Old-Slavonic Institute in Zagreb, decorated with glagolitic characters from the Baska tablet. 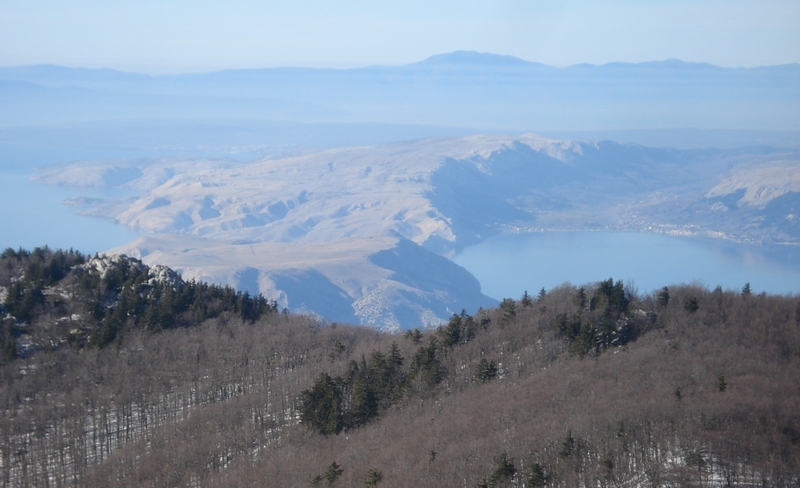 For more details see [Fučić], pp 44-65. Baščanska ploča i njeno konzerviranje [PDF], Ljetopis Hrvatske akademije znanosti i umjetnosti, Zagreb, svezak 54 (1943), 152-158. Mile Bogović: Otočac od spomena na Bašćanskoj ploči do biskupijskog središta u 15. stoljeću, Grad Otočac, Gospićko-senjska biskupija i župa Presvetog Trojstva Otočac, Otočac 2010. Bernardin Modrić: Hrvatski dragi kamen (Bašćanska ploča), film od 24 min. snimljen u koprodukciji Hrvtske radiotelevizije i Istre filma, 2010. 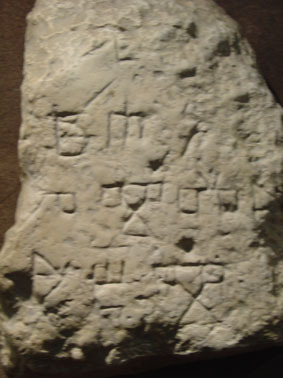 Episode with the British Prince Philip, related to the Baška tablet. On this web since July 2000, prepared on the occasion of 9 centuries since the creation of this precious stone of Croatian literacy.